Heat oven to 375°F (if using dark or nonstick cookie sheet, heat oven to 350°F). In large bowl, beat 1/2 cup peanut butter, the shortening, granulated sugar and brown sugar with electric mixer on medium speed until fluffy. Beat in egg until smooth. Beat in flour, baking powder and baking soda. Shape dough into 48 one-inch balls. On ungreased cookie sheet, place balls 1 inch apart. Flatten balls to 1/4-inch thickness by pressing with a fork in a crisscross pattern. Bake 4 to 8 minutes or until bottoms are golden brown. Remove from cookie sheet to wire rack. Cool completely, about 30 minutes. In small microwavable bowl, microwave chocolate chips uncovered on High about 1 minute or until softened; stir until smooth. Stir 1/4 cup peanut butter into chocolate until smooth. Cool to room temperature or until thickened. Sandwich pairs of cookies, bottoms together, with 1 teaspoon chocolate mixture. Let stand about 1 hour or until chocolate is firm. 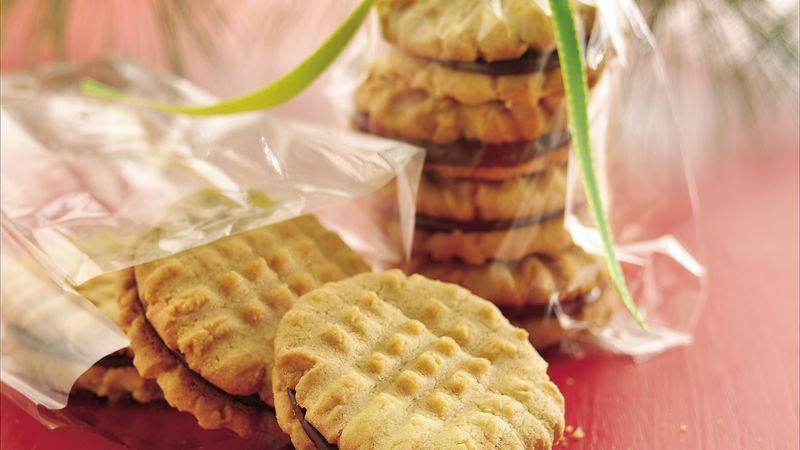 Chocolate and peanut butter come together in this bite-size treat.